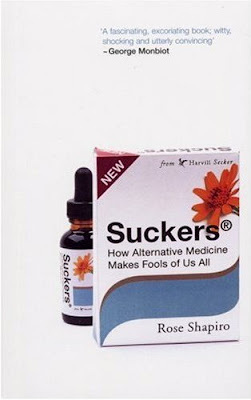 Rose Shapiro’s excellent book, Suckers: How Alternative Medicine Makes Fools Of Us All, won’t be read by the people who would most benefit from it. It’s a potted history of alternative medicine, as well as a thorough rebuttal of it, and her research is both fascinating and illuminating. Did you know that traditional Chinese medicine, described so often as dating back thousands of years, was actually a rag-bag of ideas put together under Chairman Mao to try to fill in the gaps left by a shortage of “the superior new medicine”? And the history of alternative medicine isn’t as huggy as you might think: a homeopathic pesticide was tried in Germany in 1924 – the skin, spleen and testes of rabbits were turned to ashes and then sprayed over farmland to apparently successful effect. Or perhaps they’d just cremated all the rabbits in the area. Anyway, so successful was the leporine experiment that, according to Shapiro, it was later decided to see if the same technique would work with “the potentised ashes of the same parts of young Jews.